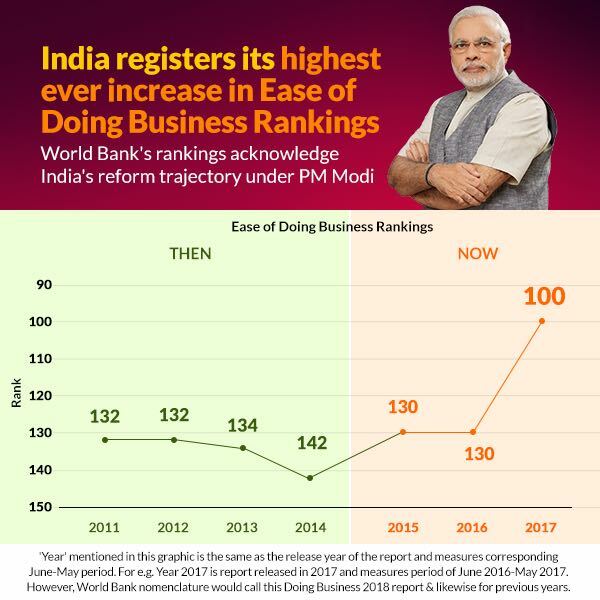 World bank has released the latest Ease of Doing business Index report for 2018 and India has moved up 30 ranks and currently ranks at 100 out of 190 countries and this is the best ever rank India has achieved. What is Ease of Doing Business Index? Ease of Doing Business index is the annual report published by the World bank after analyzing over 10 factors which are conducive to doing business in the country. It analyzes all the factors from registering a company to getting permits, electricity, credits to paying taxes and insolvency. Lower the rank, higher the chance for people to start a business easily. As of this report, right now Newzeland, Singapore, and Denmark top the rankings. India has improved by 30 rankings and stands at 100th rank compared to 130 last year. This has been mainly due to the structural reforms being taken by the Narendra Modi government such as Startup India, Digital India, Demonetisation, GST, Insolvency act etc., however, GST reforms were not taken into account because the cut off date for this rankings was until June but GST was launched on July 1 and hence, we can expect the next year rankings to be even better. I know there are a lot of people saying a lot of negative things about GST, but, as an honest entrepreneur I feel GST is a boon and it has eradicated a lot of complex processes and taxes. I know it is far from perfect, nevertheless, it is a step in the right direction and the GST council and the government are ironing out the issues on a regular basis and I hope it will bring down the prices in the near future and will be beneficial to all. I will be writing a blog post soon to bust the myths about GST and how it will actually help the people. Our Government has made plans to rank India in the top 30 Ease of doing business Index by 2030 and I really hope they succeed sooner and spring up a lot of entrepreneurs and make India and its people progress. Subscribe to the blog using the below form.